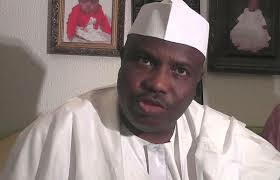 ADO-EKITI(News Investigators) /With barely three weeks to the forthcoming national convention of the People’s Democratic Party (PDP) Governor Ayo Fayose of Ekiti state has identified the youthful age of his Sokoto state counterpart, Aminu Waziri Tambuwal, as a great asset to Nigeria. Mr. Fayose made the remark in Ado-Ekiti on Friday when Governor Tambuwal, one of the party’s presidential aspirants, visited to solicit support from the state’s delegates. He explained that in this digital age, only a leader with age on his side could have the stamina, mental capacity and the grasp needed to confront and find workable solutions to the serious challenges facing the nation. He noted that besides his young ago, Mr. Tambuwal’s experience in the legislature, where he served as Speaker of the House of Representatives for four years, and as executive governor for the fourth year, eminently qualify him for the office of president. “A man can never give what he doesn’t have. Buhari’s old age and tyrannical character cannot allow him to perform. An old man cannot perform. Anybody packaging Buhari to come back is packaging him for their personal interests,” Mr. Fayose said. “I am not going to be that leader that would shut down pole from calling for restructuring. I will support and encourage restructuring and at the end of the day we shall have it,” he assured. Tambuwal further pledged that if given the mantle of leadership, his government would have respect for the rule of law and respect for human rights. ” I will not be that leader that considers national security more important than human rights,” he added. In his remarks, the Ekiti state chairman of PDP, Gboyega Otuase said “When you have a failed state in Nigeria, when you have a tribalist and a religious bigot in power, you start looking for an urbane person to right the wrongs. He told Tambuwal that Ekiti state has an interest and that as the only PDP state in the South West that is capable of altering the voting equation of the region, that interest of the state must be recognized and addressed. On Tambuwal’s delegation were Rowlence Nwuluku, ex-Ambassador to Mexico and Panama; Terngu Tsegba, a former speaker of the House; Kassim Afegbua; Ben Okoko; Bello Suleiman, ex-Minister of Power; Malawi Aliyu, Abubakar Koto, Aliyu Mohammed and Yemi Arokodare, among others.